Imagine - if you will - a cakeless birthday, a smile-less Mona Lisa, or perhaps a butterless crumpet. An ecommerce site baron of content, social voice or personality is much the same: a flat, lifeless vehicle unlikely to inspire anything much (let alone shopping). Ecommerce isn’t just about selling. It’s about building, engaging and maintaining a thriving online community. Forging connections in an otherwise vast online galaxy. In the absence of shiny storefronts, eager shop assistants and well-perfumed gangways, retailers need to flesh out their online profile so that customers can relate to their brand, understand it and become part of their world. Blogs have many perks. They can help improve your SEO, increase traffic, increase back links, generate leads, drive referrals and also help to improve the spice of your email marketing. They're also crucial tools to build and engage crucial community hubs, of which you can distill core brand values, personality and voice - and ultimately - connect. In a loud world of content marketing, we've cut through the noise to bring you some great examples of retail blogs, using the humble word to showcase brand story, voice and identity. Boohoo's UK-facing blog 'Stylefix' is a great source of curiosity. Similar in style to the popular BuzzFeed- model, it's populated with a variety of content, spanning casual observations, jokes and the irresistible 'listicle' - all working together to reflect the dynamic interests of its young, female audience. The blog is subtly interspersed with celebrity-inspired shoppable posts to help push fashionable clobber, letting readers 'shop the look' with direct links to product pages linking content to commerce. Key takeaway: populate your blog with content that reflects your customers' interests and hobbies to make it somewhere worth returning to - and don't be shy of a subtle sell - linking relevant posts to product pages in a non-invasive nod to your ecommerce site. Ah Threadless. What a beautifully unique cacophony of design, content and ecommerce - all wrapped into a cute community of designers, shoppers and (us), admirers. 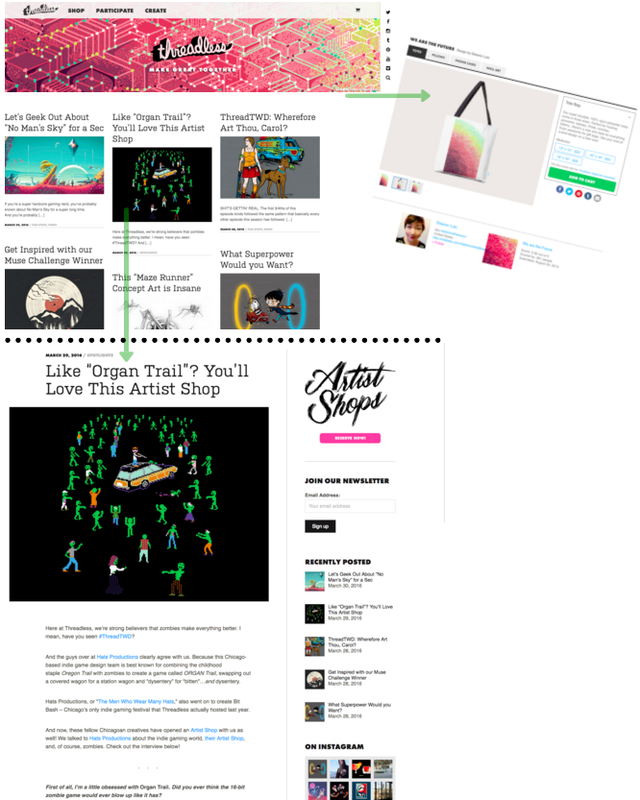 The spirit of Threadless' artistic community is well conveyed in its blog, with an interchangeable (and shoppable) header image acting as an online easel, showcasing the hard work of its community. The changing header sits atop a bundle of humorous, informal content - reflecting the brand's spirit of expression and creativity - all of which is heavily linked to its ecommerce store while remaining relevant to its audiences' interests and hobbies. There’s a certain level of irreverence that is greatly appreciated by the brand’s target market. Key takeaway: your blog should always reflect the community it serves. Keep a finger on the pulse of your community by observing your advocates' social channels, for example, and tap into the conversation with responsive posts that build-in UGC to remain a relevant purveyor of your audience's world. TOMS Shoes has one foot in commerce, and the other in philanthropy. 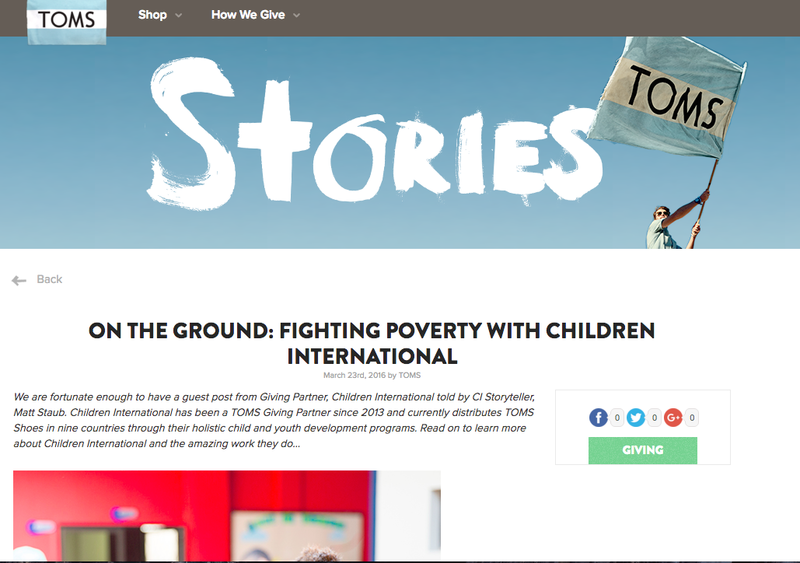 The shoe brand's 'one for one' social USP is perfectly reflected in its blog 'Stories', with a host of content dedicated to highlighting the good work it does through the continued support of its customers. The blog unites a vibrant community, with posts exploring projects it helps to fund, as well as the philanthropic adventures of its loyal advocates - helping to underline the brand's social responsibility. Key takeaway: your blog is the perfect place to distill core brand values. Use it to tap into specific USPs, such as your work in the wider community, to assert your brand as part of the world in which it operates. We already admire NET-A-PORTER's welcome email strategy for its detail and design - and now - their blog. 'The Edit' has a unique online magazine-style that inserts product, style advice and stories into a glossy editorial concept to appeal to its fashionista clique. All while remaining stylish and shoppable. Ooh la la. Key takeaway: tailor the feel and design of your blog to suit your target market, to make sure it resonates with them (and keeps them returning). A designer shopper probably won't be happy with flashing neon banners, for example. 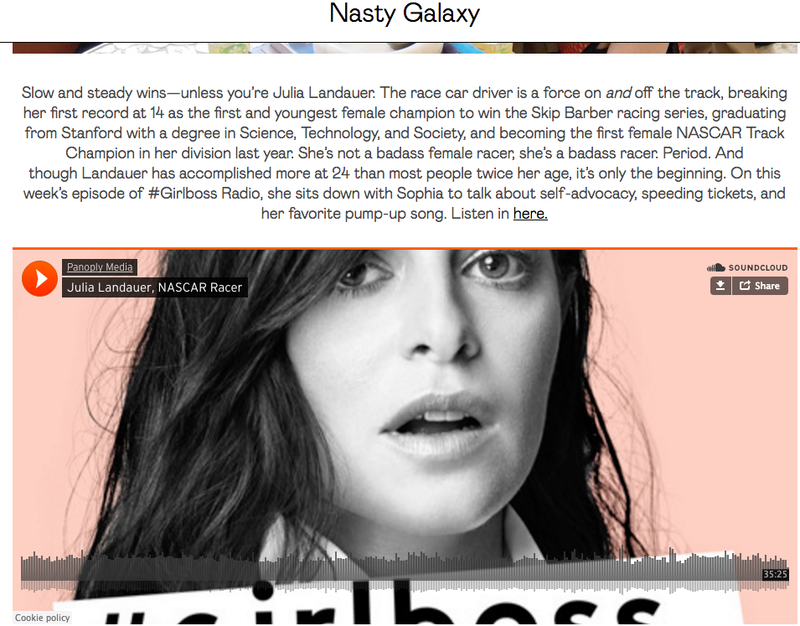 Nasty Gal's spirit of fashion-forward, free-thinking girls is perfectly reflected in their "Nasty Galaxy" blog, with femme-centric content exploring various topics from success stories to music. Founder Sophia Amoruso, who spearheads the brand's image of female empowerment, features heavily throughout, conducting interviews and providing expert advice in a mix of rich content, helping to assert brand story and the matriarchal personality which epitomises Nasty Gal. 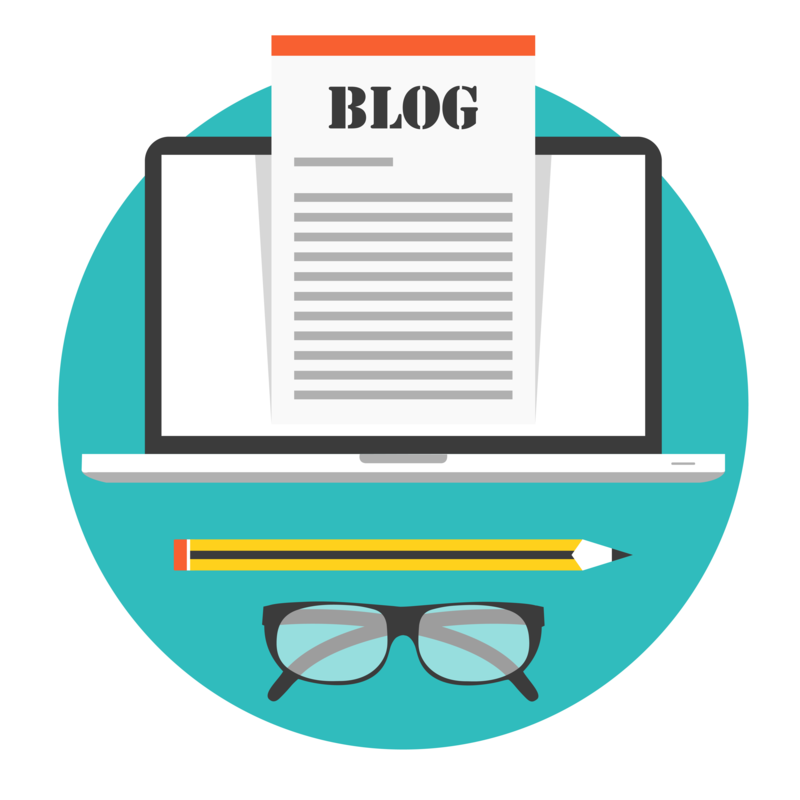 The blog is more than just a selling tool, it delves into important topics and issues that its customer base relates to, asserting it as part of the conversation, and an important part of their lives beyond retail. Key takeaway: utilise your in-house talent when populating your blog. No one better represents your brand and its voice than its creator (and their employees). Lush is just lush isn't it. Their brand is vibrant, colourful and smells really good. It has a long history of creativity and remains a friendly and accessible institution that most of us recognise (if not smell) whenever trotting down the high street. It also has a passionate fanbase. All Things Lush UK is the produce of superfan Jen Wright, who reviews products on behalf of her vegan-brethren. Even though this blog isn't technically affiliated with Lush, it provides a unique example of how brand's can interact and engage with their advocates, with Lush providing unique access to its range of products and facilities to its dedicated hero, Jen. Jen posts informative YouTube product reviews and behind the scene glimpses into Lush's manufacturing process, helping to bring the brand alive and take the products off the shelf and into the world of its customers through the eyes of "one of them". Key takeaway: your brand will have fans. If not, you might as well close shop. Influencer marketing is big business. Forging and fostering relationships with influential bloggers is an essential strategy in a consumer world increasingly driven by social proof. ASOS has an active youth audience, with strong connections to the student population and a vibrant online voice - all of which is well-represented in its ASOS Likes blog. Taking the familiar listicle model favoured by its target market, the ASOS blog taps into the conversations of its audience (such as celebrity culture and trending topics) to remain relevant and part of the moment. Key takeaway: your content doesn't always have to sell. It can simply be a platform to showcase that your brand is perfectly aligned with its customers' world. 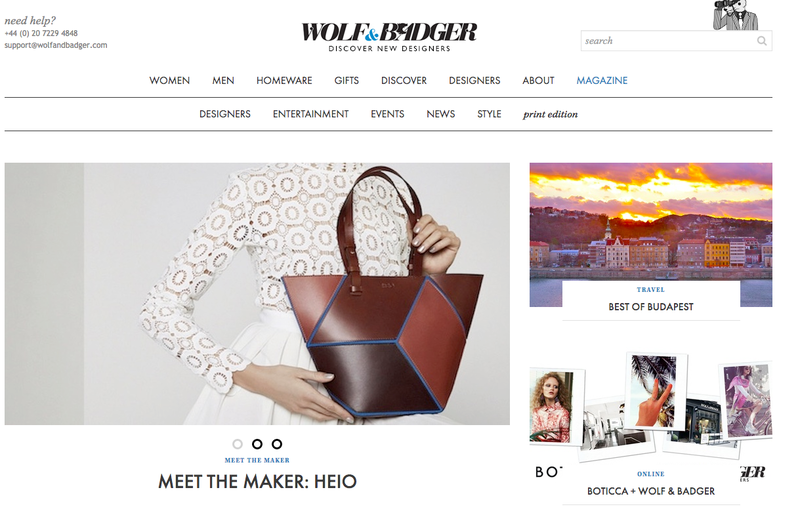 Wolf & Badger's blog is another haven of relevance, with content tapping into the affluent, worldly lifestyle of its target audience with travel posts and 'meet the maker' content, providing a unique insight into the life of their products. Key takeaway: use your blog to provide a deeper insight into your products - highlighting the origins of key materials, concepts and designs - to bring your products alive. 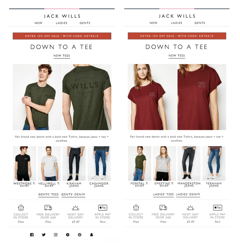 Jack Wills' blog is another great example of how blogs can connect brands with their target audience. The blog is chock full of toff-tastic content that mirrors the attitudes and lifestyle of its well-to-do younger clique. Its "Seasonnaires" project - an elaborate UGC ploy putting "party-mad, beach-loving" advocates on holiday "courtesy of Jack" - is a great example of using your blog to put your customers at the heart of the brand story, to engage and attract your target market. Key takeaway: launch community-engagement projects that encourage two-way relationships with customers, to make your brand part of the conversation. Jack Wills' "Seasonnaires" project is a great example of utilising advocates to boost UGC that perfectly represents your audience and the way they interact with your brand. Blogging, once the reserve of the opinionated computer-literate, is now at the centre of much content marketing/brand-building activity. As well as the important SEO, back-linking business, retail blogs are an essential vehicle to distill voice and tone, to connect customers with brands beyond the shopping basket. Keeping your blog regularly updated and populated with content relevant to your target market and brand story adds another dimension to your online voice. Moving beyond 140 character limits, blogs bring a vital insight into what you are - and what you think.